Sorry to make you bounce back-and-forth between two (and even three) sites to get a glance at each player's defense. D-O-V handles graphics better. If you open a second window at D-O-V you'll see the at-a-glance defensive charts. We assume you put these side-by-side with the text at SSI. First is Heredia's, second is Maybin's. Up-and-down the left side is hang time; at the top of the graph is an 8-second popup. Side-to-side at the bottom is the player's distance from the ball's landing spot, so at the far right is a 140-foot run. Obviously you can't run 140 feet in 2 seconds, so the catches make a neat little graph going up to the right. If you want to compare each catch to ML averages ... here's where you've got to go to Baseball Savant itself. Here's Heredia's graph and here's Maybin's. Hover your mouse over the red dot on Heredia's graph, where it says 5 sec x 100 feet, and you'll see a 41% catch probability. Where does all this leave us? Maybin has been a =0 type center fielder in UZR, regarded a good glove there. Heredia by the same measurement -- it's important to use the same measurement -- has been a fielder about -5 runs per year. This coincides with their reputations. Does it coincide with the StatCast graphs? A careful reading leaves them looking about the same to me. Heredia makes fewer "great" catches -- but Maybin has a few more balls fall in on him that could be caught. My reading is a draw. But! A shade the better, a shade the worse for glovewear, that is most decidedly NOT what this trade is about. The deal-io is the offense. 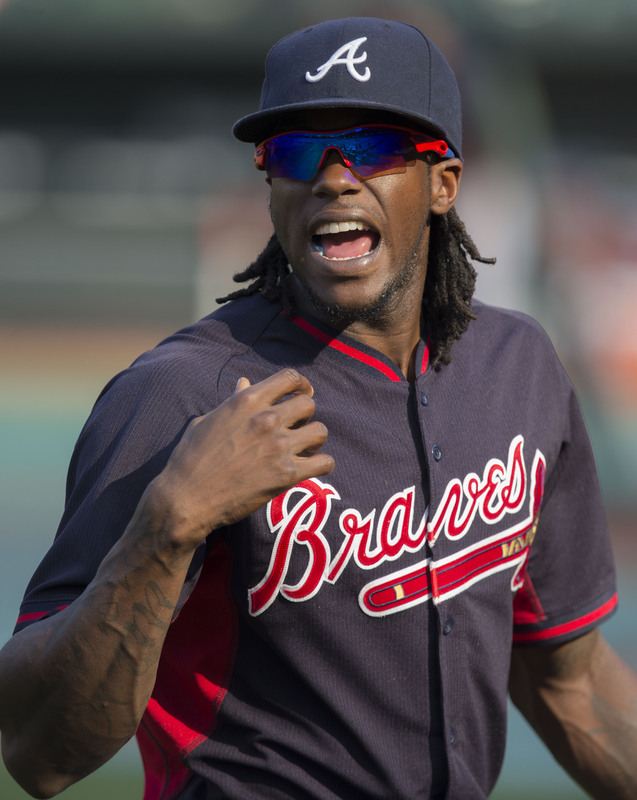 Over the course of his career, Maybin has been a rock-steady hitter, a .250 / .335 / .370 hitter. That's a disappointment compared to what he was supposed to be when drafted, and it's not that anybody's going to bat him fourth. But! you can count on him for that .250-with-other-stuff production. On the other hand, Heredia poses the "length of lineup" bumpersticker a fairly sizable problemo. Since he's been "exposed" to regular play, about 75 games ago, Heredia has batted .215/.295/.300. So the difference is approximately that between Dee Gordon and an automatic out. To boot, the Mariners hope that Maybin is playing in momentum. The last 28 days, Maybin has ripped along at .333 / .471 (!) / .463. So Dipoto makes a minor trade, to go get what he sees as a legit center fielder. If Maybin gives him an average, 90 OPS+ hitting centerfielder with an average glove, that's a markup. If Maybin is having a career 2H, great great great. It's not a big trade but as somebody put it, the Wild Card 2 race "will be decided at the margins." I like this way of putting it. If Adam Warren or Zack Duke, or, far more probably, Cameron Maybin constitute the difference between +1 game or -1 game, that's what it's all about. Why the Mariners sent down Ben Gamel rather than Cameron Maybin, you tell me. I'll take it as a positive shot, one across Denard Span's bow, that he's going to play a ton. Since he got to Seattle, he has hit .301 with a .343 OBP and a .468 SLG, while taking over the #3 slot in the batting order. I guess that Gamel move is clear enough. Denard Span is the player that the 2018 Mariners will win or lose with. So, we'll assume that in the ensuing dead-heat WC race, Dipoto preferred to play with an OF consisting of Span-Maybin-Haniger, with the backup OF playing very little and when he does, it is to be as a late-game defensive backup. Dr. D? He likes it. It's not the Big Move we hoped for, but it's an engine tuneup against the pesky rodent A's. Gotta love it. Haven't heard that one since it was common in Jr. High and early High School (apparently later too, 'cause you must've heard it). Colorful writing appreciated. Re: Heredia vs. Gamel, I like your take that the real upshot of this surprising move is to install Denard Span as Out Leftfielder. If the playing time is going to be scarce, you'd rather have better defense and versatility. That's not going to degrade much with limited playing time. Hitting skills will degrade under those conditions, especially with young players. Where would we be without Denard Span? I mean, the guy has seized the Cano-vacated number three lineup spot and kept it afloat. Who else in our lineup looks like they could have done that? Zilch, Zero, Nobody. Not even Haniger, who wilted there. Vince wasn’t all that great a leadoff guy when we got him, Cora always seemed more suited for it to me. But Vince “solidified” a problem When he joined the team. These vets we are picking up: Gordon, Span, Colome, LeBlanc, Leake...they look like less than we want, but they seem to be extremely well suited for the battle at hand. I kinda think Maybin is in that mold as well. Segura, Cruz, Paxton, Diaz, Cano, Haniger, Gonzales will carry the team, but these guys will hold it together and keep it from falling apart. Maybin, on paper, makes us marginally/incrementally better. But the difference is close enough for it to amount to "chatter" over 52 games. I get the Maybin acquisition, although I think it came about because Dipoto couldn't get a better guy. All in all, it is a standard type of deal. Can live with it. Despite Heredia's two hits last night, the Gamel-down thing bamboozles me.
. . . how does the data account for the fact that Maybin has played in the corners most of the season? Speaking of maginality, Vincej looked horrible at third. And does anyone know where Seager's wife had the baby? If in Seattle, is there any reasonable way he couldn't have played last night, assuming the birth was Tuesday? All of this is just idle carping. A prolonged slump will do that to you. I think I will quickly become an addict for Baseball Savant. Heredia shines here: But if you give him (at the bat) 9 more hits to make up for the difference between he and Gamel, or 10 for Span and 11 for Haniger, he still doesn't hit like them. Ditto Maybin. In essence, their glove can't cover for their bat. You can likely survive one guy in the OF like that, but probably not two.